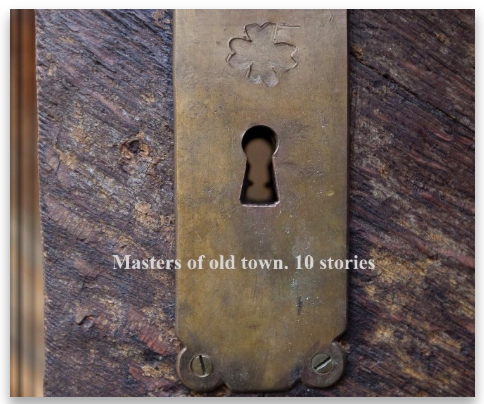 10 masters, 10 stories. The unique atmosphere of the old Tallinn keeps by its masters. Such professions as the stain-glass artist, calligrapher, shoemaker, blacksmith, glass blower, hatter, chef, jeweler, bell ringer of the church and chimney-sweeper still exist in the city and being increasingly in demand. Magnificent handicrafts of blacksmith decorate gates and buildings of the Old town. Beautiful vases made by glass blower, pretty hats, magic stain-glasses windows and unique pieces of jewellery art could be seen nowadays in the Old town. You can have a feast on tasty squash soup made on medieval recipe at the walls of Toompea. Here you have a possibility to take lessons of calligraphy art, rub the happy button of the chimney-sweeper, accidentally met on the narrow street, repair shoes if needed. Devine change ringing of St. Nicholas Church’ bells could be heard all over the Old town. Masters invite into the atmosphere of medieval Tallinn and exhibit their works. The photos of the project 'Masters of old town. 10 stories' are in collection of the Hopneri Maja in Tallinn, Estonia. Preview and purchase directly in Blurb Books here.